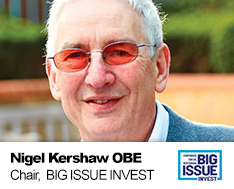 Nigel is Executive Chairman of The Big Issue Group a leading social entrepreneur and advocate of social enterprise and finance. The Big Issue is one of the world’s most successful and best-known social businesses; its mission is to dismantle poverty through creating opportunity by self-help, social trading and business solutions. Over the last 25 years, The Big Issue magazine has helped more than 92,000 people affected by poverty earn £115 million by selling over 200 million copies in the UK. It has globally inspired over 100 similar publications in 35 countries. Big Issue Invest (BII) was set-up to be a ‘social merchant bank – by social entrepreneurs, for social entrepreneurs’. It currently manages or advises on £150 million worth of social funds and has invested in over 300 social enterprises across the UK. BII is also bringing the mainstream to social finance. In partnership with Columbia Threadneedle, the UK Social Bond Fund is the UK’s first social investment fund offering daily liquidity. Currently, it has raised over £100 million. BII is currently launching with Standard Life the UK’s first retail social equity fund investing in sustainable job creation. By adding rent data to credit files, BII is also helping pave the way for 2.7 million social housing tenants in the UK improve their credit score and enabling them to access more affordable credit and financial services. Prior to The Big Issue, Nigel worked in the print industry. He trained as a lithographic colour printer and founded three printing and publishing employee-owned companies. Nigel is a Social Enterprise UK ‘Champion of Champions’ and the winner of the Institute of Directors’ Good Enterprise Award. Currently he is a member of the Advisory Group To Government: Creating a Culture of Social Impact Investment and Savings. In 2010, he was awarded an OBE for services to Social Enterprise.